A sphere made of geometric primitives - enthusiasm for mathematics is the source of inspiration of the designer Raimond Puts. With his Raimond pendant light whose perfect round shape consists of triangles only, he memorialized himself. Numerous LED bulbs at the intersections of the triangles provide a magic sphere just like stars in a cloudless night. 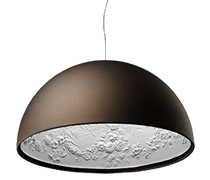 The Dutch manufacturer Moooi offers the Raimond pendant light in different sizes (Ø 43 cm, Ø 61 cm, Ø 89 cm). Furthermore it is available in a conventional, as well as a dimmable version.